[Giacomo] finds that every once in awhile, he needs to flash a sketch to an Arduino while on the go. While he doesn’t always carry his laptop with him, he almost certainly has his Zipit Z2 on hand. He prefers to use the Zipit because it’s tiny, it uses Debian, has built-in WiFi, and can run for about 5 hours before requiring a recharge. 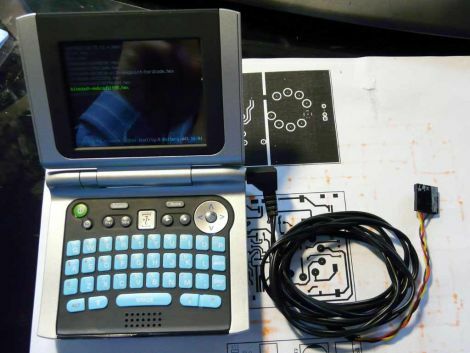 The only shortcoming is that the device lacks a serial port. Following instructions we featured last year he added a serial port to his device, then built a small converter cable that allows him to connect it to virtually any Arduino. He says it only takes a moment to get avrdude up and running on the Zipit via apt-get, and once that’s done, he is in business. He wrote a short script that saves him from entering the flash command over and over, so the process couldn’t be simpler. He does mention that since the Zipit does not have a DTR line, Arduino resetting must be done manually. For the convenience of flashing sketches from the palm of our hand, we can deal with that. Check out the video below for a quick demonstration of his setup. [Nulluser’s] Zipit was fine, but it couldn’t go anywhere on its own. 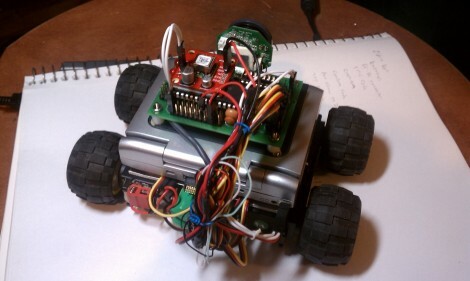 Adding some motors and a microcontroller fixed that issue, and now he’s got a little robot called the Zipitbot. That’s a dsPIC board on top which communicates with the Zipit over an I2C bus. Four servo motors provide plenty of power to the wheels,with some extra battery packs nestled between them. Since the Zipit is running Linux, and already has WiFi hardware, it’s not too hard to add Internet control. With this in mind there’s a webcam on the front to broadcast a video feed for use when controlling it remotely. See a couple of videos of this hack after the break. This USB to Zipit Dock adapter and a special kernel makes USB host mode for the Zipit possible. 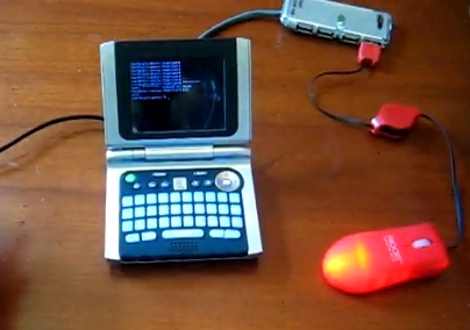 Previously, the cheap and hackable wireless client needed a hardware modification to enable USB support. The new kernel bootloader, called U-Boot, makes the internal alterations unnecessary (see the demo after the break). Now the only caveat is one of voltage. Zipit only supplies 3.3V when running on battery so your choices are to only use USB when the Zipit is plugged into a charger, or use a powered USB hub. But if you’re already building a hub adapter it shouldn’t be too much trouble to add in the option for a battery-powered hub. So can we play our NES games using a USB controller now? Going even further back in time than 4th gen, [Kevin] tipped us off to this project by [Hunter Davis]. It is a collection of software mods for Zipit’s Z2 instant messenging device. Some of them include allowing it to run (ports of) the Fluxbox window manager, FCE Ultra NES emulator, and (most impresively) the Java framework. The next leap in development, a SNES emulator optimized for the Zipit, is in the works. The Z2 runs Linux out of the box. This means you no longer have to reflash the device to add software, such as DOSbox (also introduced to the Zipit by [Hunter Davis]). Be sure to check out the video demo of FCE Ultra on the Z2 above.